Will the Earth have two suns in 2012? Will the star Betelgeuse explode and make the nighttime as bright as midday? Why not? See these posts by Ian O'Neill and Phil Plait. And national news outlets that pride themselves on being reliable (I'm looking squarely at you, Time and CNN), shame on you for just copying someone else's story rather than checking it out first. Fox News managed to get it right. Astro101 is an occasional series touching on the very basics of astronomy. Last week, there was a surprisingly big flurry of astronomical news. Not over all of the exciting science coming out of the annual meeting of the American Astronomical Society, despite all of the exciting results. Rather, the kerfuffle erupted over comments that astronomer Parke Kunkle made in an interview with the Minneapolis-St.Paul Star Tribune regarding astrology: namely, that the sun passes through thirteen constellations, not just the twelve, and that the signs of the zodiac don't align with astrological signs. Instead, let's focus on reality and learn something about the constellations and the zodiac, making use of what some might call a "teachable moment". Let's start with the definition of a constellation. In ancient days, constellations were specific patterns of stars in the sky that made a more-or-less recognizable picture. Today, these patterns are often called asterisms. A well-known asterism in the northern hemisphere is the Big Dipper (or Plow). Ancient astronomers defined many different asterisms, but most of these varied from culture to culture. Also, not every star in the sky was part of a constellation, nor did anyone seem to think that every star had to be. 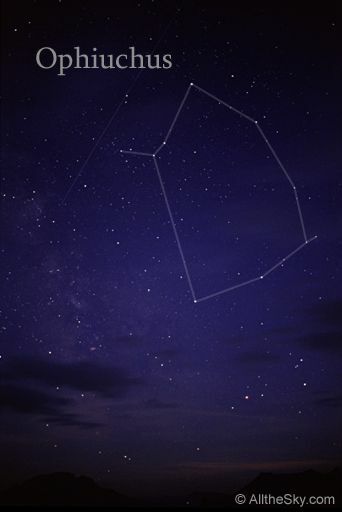 Many of the patterns we call "constellations" today were used by the ancient Greeks. The Scientific Revolution, which started in the mid-16th century, began the modern science of astronomy. One important thing that modern astronomers learned early on was that there are interesting objects all over the sky, and in order to study these objects, astronomers need to make catalogs detailing where each interesting thing is. The most commonly-used method of cataloging involves a coordinate system on the sky, known as Right Ascension and Declination (akin to longitude and latitude on the Earth). However, many astronomers also referred to stars as being in constellations. This didn't mean that a star was part of the pattern, but merely that it was in the same region of the sky as the better-known constellation. Since the boundaries of constellations were not well-defined, this led to lots of confusion. So, in the late 19th century and early 20th century, astronomers defined official boundaries to every constellation. The result is that every portion of the sky belongs to one and only one constellation, even if there are no bright stars in that part of the sky corresponding to some recognizable pattern! This is analogous to the United States, where every square inch of land belongs to a state, even if nobody lives there. As you hopefully know, the Earth orbits around the sun, completing one circuit every year. Because we are moving, we have a different viewpoint of the sun and sky every day. In particular, the sun appears to move against the background stars, completing one full trip around our sky in a year. If you don't believe me, go to the SOHO solar observatory movie page and watch the most recent LASCO C3 movie. The SOHO satellite constantly takes pictures of the Sun, and the LASCO is a camera that blocks the sun's bright disk so its faint outer atmosphere can be seen. In addition to the sun's atmosphere, you'll see tiny white dots moving from left to right across the image. These are the stars. Once in a great while, you may even see a pattern of stars that you recognize, like the Pleiades star cluster. A few months later, you can go out in the early morning and see these same stars high in the sky. The sun always appears to go past the same stars around the sky every year. This is because the Earth repeats its orbit every year, and so at the same time every year we have the exact same view of the sun and the stars. This path is called the ecliptic. If you could see the sun's path drawn on the night sky, you would see that the ecliptic appears to be a complete circle around the sky, and that this circle goes near or through some familiar star patterns, like Scorpius, Leo, and Gemini. Although ancient astronomers could not make pictures like the SOHO spacecraft takes, through careful observation they were able to deduce the path of the sun through the stars, and, by definition, the ecliptic. The zodiac is the group of constellations through with the ecliptic passes. In other words, over the course of a year, the sun passes through all of these constellations. Traditionally, the zodiac contained twelve constellations. In Europe, these constellations correspond to the twelve signs of the zodiac that astrologers often quote. The number of constellations is not an accident -- since many cultures have 12 months in a year (corresponding to the roughly 12 cycles of the moon that fit into a single year), ancient astronomers thought it made a nice balance if the number of constellations equalled the number of months in a year. But different cultures had different constellations and so different "signs" of the zodiac. More importantly, the sun's path doesn't depend on how we humans define constellations -- the ecliptic is the same whether there are no constellations, 12 constellations, or a billion constellations. The constellation Ophiuchus, the serpent bearer, is an old constellation, but one that most people have not heard of. It lies north of the constellations Scorpius and Sagittarius. But one star of the pattern sticks down between the two constellations: theta Ophiuchus. This star is the right foot of the serpent wrangler. And the ecliptic (the sun's path through the sky) passes right past this star. So, the sun's path takes it through part of the constellation Ophiuchus. Even though astronomers arbitrarily defined constellation boundaries, by any Greek's definition of the boundaries of Ophiuchus, the sun's path must go through the constellation. Whether or not ancient astronomers realized this, I don't know and don't have time to research. But having a thirteenth sign of the zodiac would ruin that nice balance between the 12 months of the year and the (roughly) 12 lunar cycles a year, so it's not surprising that Ophiuchus is not considered a sign of the zodiac. But the fact remains, both by official definitions and by classical definitions of constellation boundaries, the ecliptic passes through 13 constellations. So, if your astrological sign is "supposed" to be the constellation in which the sun is present when you are born, some people who should be Ophiuchans are left out in the cold. But astrologers have many (and differing!) "explanations" for why this doesn't matter. Remember, the sun's path through the sky repeats year after year, so the ecliptic remains the same. But Earth's axis of rotation, the direction in which the North Pole points, changes over very long time scales. Every 26,000 years, the Earth's axis makes a big circle in the sky; this motion is called precession of the equinoxes. If you've ever seen a toy top or gyroscope, you'll have noticed that it wobbles, with its spin axis making circles. This is basically the same effect as the Earth's precession! Precession has two major impacts over that long time span. First, the star we identify as the "north star" changes every thousand years or so. But more importantly, since Earth's seasons are caused by the Earth's tilt, the seasons slowly change. If we defined our calendar by the sun's position against the stars, our seasons would slowly get out of sync. After 13,000 years, our "summer" months would be cold, and the "winter" months would be hot. This would be confusing. Therefore, the definition of a "year" that we use for our calendars takes this slow change into account. Therefore, June will always remain the start of the northern summer, and December the start of the winter. The effect of Earth's wobble will therefore be seen in the stars. In 13,000 years, the stars we now see in December will be up in June, and the stars now up in June will be visible in December. This change is gradual, but noticeable with careful observations. The first recorded observation of precession was by the ancient Greek astronomer Hipparchus in the 2nd century BC. The signs of the zodiac that most modern astrologers use were defined by the ancient Greeks, as I've said. That was about 2200 years ago. One full circle of the precession of the equinoxes takes 26,000 years. Take 2200 divided by 26,000, and you get 1/12. In other words, since the ancient Greeks defined the zodiac, the Earth has completed 1/12 of a precession cycle. This means that the constellations are about 1/12 of the way through their yearly changes, or that they appear about 1 month out of sync with what the ancient Greeks saw. But astrologers use definitions of zodiac birth times set by the ancient Greeks, so although a person born in early August may be called a Leo, the sun is actually in the constellation Cancer at the time. If this bothers you, just stick around another 24,000 years, and things will be back to "normal". Now you have the full, lengthy story about what Parke Kunkle said in that interview last week. Hopefully you've learned something along the way! But none of this is news to astronomers. And, as I've said, astrologers have a wide variety of excuses for why this doesn't matter, and have used these excuses for centuries. So, perhaps the bigger question is, why did this one news story (not the first to talk about Ophiuchus and the precession of the equinoxes) make such a big impact in the news? Is it an indictment of how little our society knows about the science of astronomy? Or should I be optimistic and take it as a sign that society is actually starting to pay attention to what is really happening in the sky? Given that Americans spend at least as much money on astrology every year as the National Science Foundation spends on astronomy research, I'm not feeling very optimistic. It's been a busy couple of days here at the 217th meeting of the American Astronomical Society. I've spent a lot of time in meetings and talks the last two days, so I haven't had much time to sit down and blog. Here are a few little tidbits, not meant to be comprehensive. Just nuggets that I found interesting. Click on the links for more info. The biggest picture yet made: The Sloan Digital Sky Survey, which is taking pictures large portions of the sky, released what they are calling the largest picture ever made, over 1 trillion pixels. I'd suggest against downloading the full-resolution picture (which actually isn't available as a single file), unless you have a roughly 10 Terabyte (10 trillion byte) hard drive. However, you can go to their website and look up portions of the picture corresponding to your favorite objects, if that object is in the portion of the sky looked at by Sloan. New, amazing pictures in wavelengths of light invisible to the human eye were released. Planck, a satellite studying the entire sky in microwaves, released their early science data. Lots of cool stuff there. Fermi, a gamma-ray satellite, also talked about some amazing discoveries, including anti-matter made in thunderstorms on Earth. The Herschel Space Observatory, which looks at the sky in long-wavelength infrared ("heat" from very cold objects) released lots of science results, including this picture of the Andromeda Galaxy, a nearby sibling of the Milky Way. Lots of talks on planets around other stars. That's great, because there is a ton of great data streaming in from numerous missions and planets. I did think there were too many plenary talks (talks designed for everyone to attend) about planets. There are other topics in astronomy, too. Anyone who still holds the stereotype of the astronomer as an old male hermit should have been at this meeting. There are a lot of young, motivated researchers, socially well-adjusted, and of all genders and ethnicities. This is not to say that astronomy does not still have issues with genders and minorities -- it does! But the science results are not dominated by an old man's club anymore. All in all, I had a great time and have some inspiration for more research work. But for now, it's time to go home and prepare to teach the spring semester. This week I am at the 217th meeting of the American Astronomical Society in Seattle, Washington. There are nearly 3000 astronomers registered for the meeting and swarming all over downtown Seattle. There should be lots of exciting astronomy news coming out of this conference; keep an eye on your newspaper or sites like Universe Today for the full complement of news; I only get to see a small portion of all the excitement! Today's news included a Kepler discovery of a planet only a little larger than the Earth and a cool Hubble picture of Hanny's Voorwerp, a cloud of ghostly, greenish glowing gas discovered by a Dutch school teacher. The planet is about 40% larger in diameter than the Earth and has a mass about 4 or 5 times that of the Earth, which means it almost certainly has a core of iron and nickel surrounded by some rock. It would not be a great place to live -- it circles its parent star every 20 hours and likely has a surface temperature of 2500 degrees Celsius. As one astronomer said about another, even hotter Jupiter-sized planet, "It's not very hospitable." Over lunch, I went to a town hall meeting led by the National Science Foundation (NSF). The NSF is trying to balance an ambitious plan for astronomy research in the new decade with extreme pessimism regarding future budgets. Even with optimistic budgets, the NSF and the astronomy community would have to make some tough choices regarding priorities, but it is the uncertainty about the budget that seems most concerning. Many of the planned projects may not need money until 2017 or 2020, but require concrete investments today. Given that we don't yet have a federal budget for the fiscal year that started last fall, plans for a 2020 budget are just pipe dreams. At least we are far better off than our British colleagues (for now). The quote of the day came during the National Science Foundation town hall meeting during an answer to a question about Advanced Technology Solar Telescope (ATST, a new, advanced telescope to study at the sun): "We have an extragalactic astronomer [an astronomer who studies distant galaxies] in charge of ATST because there's nobody in astronomy who knows anything about the Sun." Welcome back to a new year (and technically a new decade, though I celebrated that a year early)! All of us on this celestial ball have just started a new revolution about the Sun (technically the center of mass of the Solar System, which is close to the Sun, but that's not important for most people), so we tend to look forward to a new year full of possibilities and discoveries yet unwritten (or half-written, in my case, but that's another column). I've blogged many times about the important contributions that non-career astronomers have made and continue to make to the science of astronomy. Just earlier this week a 10-year old Canadian student, Kathryn Gray, became the youngest known person to help discover a supernova (exploding star). One of the largest organizations of citizen astronomers is the American Association of Variable Star Observers, or AAVSO. The AAVSO was organized in 1911, which makes this year their (let's see, subtract 1911 from 2011, borrow 1 from the thousands column....) centennial! 100 years! That's no small accomplishment, and the organization is only continuing to grow in membership and impact. Members of the AAVSO participate in science by monitoring the brightnesses of stars. Many stars change their brightness, hence the term "variable". The reasons for these variations are many. Some stars are really close pairs of stars that periodically eclipse each other. Some stars grow and shrink in radius due to an unstable structure. Some stars are pulling material off their companions. And some stars have planets that occasionally block a tiny amount of light of their parent star. The most important tool needed to study variable stars is time. While many variable stars change their brightnesses in predictable fashion, many others are unpredictable. And professional telescopes have too many varied research projects to sit and stare at a star that may do nothing for months, years, or even decades before it does something interesting. The total membership of the AAVSO does have the time and telescope power to watch these stars and notify the big telescopes when something unexpected happens. But the AAVSO does much, much more than simply act as night watchmen for professional astronomers. Their measurements of star brightness are often just as accurate, and in some cases better, than those obtained by professional astronomers. AAVSO members and their data regularly appear in scientific papers. They are discovering hitherto unknown planets around other stars. They are discovering changes in variable stars that professionals would never have noticed. This is all cutting edge science. You do not need to have a degree in astrophysics to participate in the AAVSO. You don't even need to have thousands of dollars worth of equipment. You just need an interest in astronomy, a willingness to learn how to make astronomical measurements, and dedication to looking up at the sky. Why not stop by the AAVSO website, read about their centennial celebration and their history, and see if any of their ongoing projects tickles your fancy. There's no reason you can't discover a supernova or a planet yourself!